Later this month, CodeBook International will be granting a graceful retirement to its old website and starting a new era of expansion – both international and into new market sectors – with a new-look site, a new logo, and – to accompany our new(ish) blog – a new Twitter account. The new corporate identity and website have been created by Farnham, Hampshire-based digital agency 1minus1. 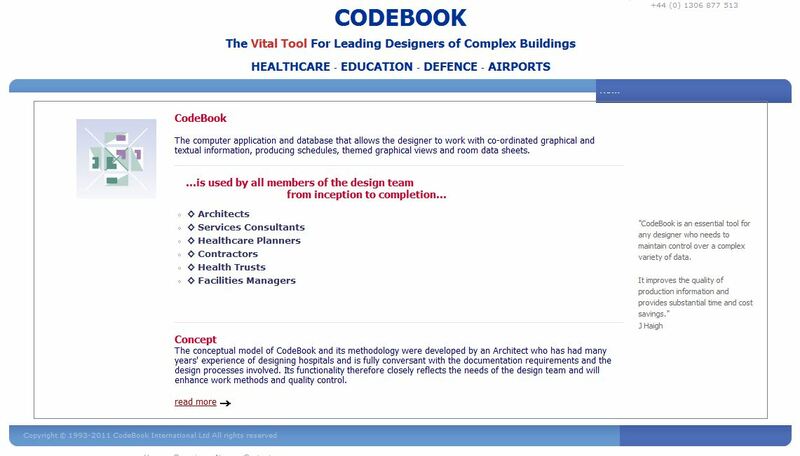 The ‘ribbon bookmark’ logo hints at use of CodeBook as a key source of reference, helping users find key information about their building project. We have also taken expert advice on using more ‘social media’ channels to help spread the CodeBook message, and to provide more interaction. Why not subscribe to our blog (either through its RSS feed, or as an email subscriber), or follow @CodeBookInt on Twitter? However, we won’t be neglecting traditional communication channels – such as face-to-face. Users in north America, for example, will be able to come and talk to us at Autodesk University in Las Vegas, 29 November – 1 December 2011. We will have a stand at this event (stand 4C), and will be keen to talk to both existing and prospective users of CodeBook. This entry was posted in CodeBook, construction, marketing and tagged 1minus1, AU2011, Autodesk University, blog, CodeBook, design, Twitter, website by Peter. Bookmark the permalink.